Love to enjoy cannabis but don’t want to smell like weed? Perfect! We have the list of alternatives and ways around smelling like dank when you want to enjoy it daily. Here is your how-to guide to not smelling like weed. Mark Seegmueller of Mad Mark Farms out of Enumclaw, WA gave Evergreen Market a tour recently, showing his veg and grow rooms and letting us explore the glorious cannabis flowers his team produces for our state. Recently, Willie’s Reserve gave a tour of their located in Seattle, WA, where they source flower from local farmers around the state of Washington, to support small business and continue to use the legendary name of Willie Nelson to move forward the cannabis industry and culture. In its fifth year running and first year at the Washington State Convention Center, CannaCon filled three days with interactive booths, informative seminars, plus talks with key note speakers such as Vicente Fox, the former President of Mexico and cannabis advocate. High Group was created by a few local friends, all photographers, videographers and creatives, to unite the creative & cannabis communities in the Seattle area. They have organized street meets, parties and artistic endeavors resulting in connecting like minded people to output creative energy into the art world. Meet their team! Meet Chef Jeremy Cooper, Director of Research and Development at Fireline Cannabis, expanding their fire cannabis products into an edible line. We tour the facilities North of Seattle in Arlington, Washington, tasting a variety of delectable chocolates after signing a nondisclosure agreement, here are the goodies we could share with you! Escape city life with a getaway to forest dwellings at the 420 friendly Mountain Views B&B Retreat, where the Pot Leaf Treehouse awaits you! 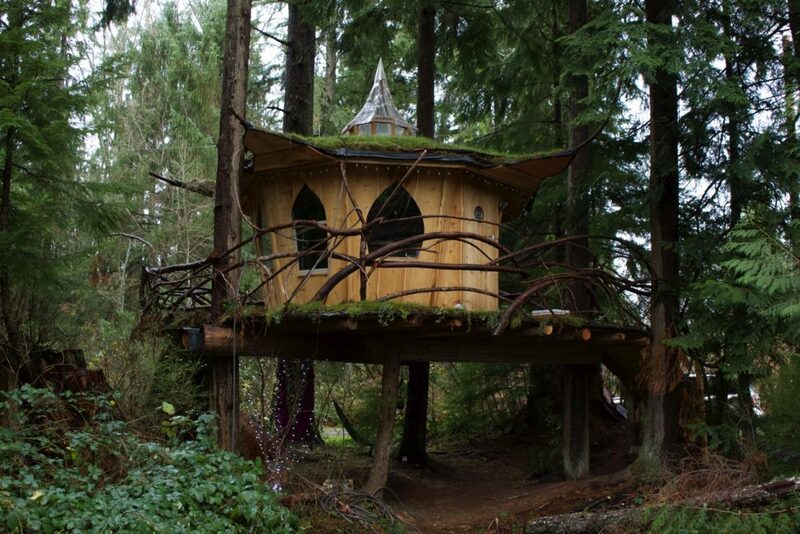 Choose from gypsy wagon homes, tree-houses, camping or even a bubble dome to stay in while exploring the magical forests that surround Monroe, WA. Get on a higher level and get to a Higher Education Talk presented by one of our edible vendors- The Goodship. From conversations on science and technology to arts and even witchcraft, we recommend you get your mind in the right place and come ready to talk about some innovative and insightful topics.